There’s only one person in the way of you unleashing your potential: you. There’s also one person who can move you out of the way so you can perform at your peak. That person is already inside you. You just need to unlock them. This other part of you is your alter ego. 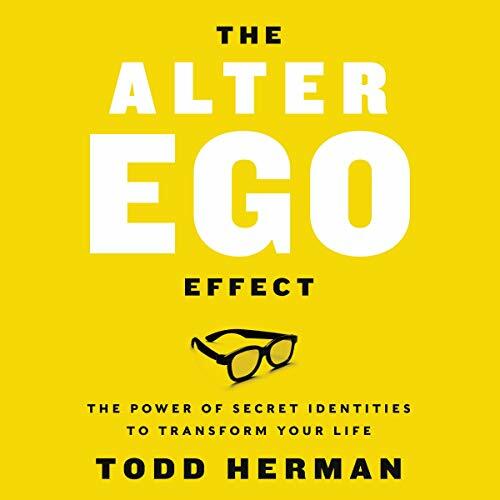 After 21 years of working with elite athletes, performers, and leaders, Todd Herman has discovered how you can use your alter ego to achieve the seemingly impossible. It all clicked for Todd when he met Bo Jackson. When Herman met Bo Jackson, the professional athlete told him, “Bo Jackson never played a down of football in his entire life.” Bo explained that when he was young, he’d get into trouble because of chaos caused by his anger issues. Then, he saw Friday the 13th and became fascinated by the cold, calculating nature of Jason Voorhees. In that moment, he resolved to stop being Bo Jackson and start being Jason the moment he stepped on the field. In this transformative guide, Herman teaches you how to create and control an alter ego like Bo - and the thousands of other athletes, business leaders, entrepreneurs, and entertainers who have used this simple tool to change their lives. Herman also shares his own story: He knew that inside was a confident, self-assured, intelligent person who could help others get better results in their lives. When he started using Superman’s classic trick - putting on a pair of glasses - he learned to trigger the specific traits he needed to achieve his goals. The Alter Ego Effect is not about creating a false mask - it’s about finding the hero already inside you. It’s a proven way of overcoming the self-doubt, negativity, and insecurity that hold you back and empowering you to ultimately become your best self. This book is incredible. I read a lot, at least a book a week, and this one is right up there with the best. It will show you a simple way to improve your performance in areas of your life that matter most. *It wraps up so many important concepts into a simple package anyone can understand and get value from. *Its actionable. I’m already seeing results. *Best of all... its fun. The stories, the exercises, and the whole entire concept is fun. Haven’t enjoyed a book this much in a while. Get it, read it, put it into action. You won’t be sorry. Well done Todd Herman ... really exceptional work. LOVE this audiobook! If you have ever been plagued by imposter syndrome or let the little voice in your head convince you not to follow your dreams, this is the book for you! Or if you are a competitor looking to gain a performance edge, yep, it can help you too (whatever your “field of play” might be). Todd Herman’s depth and breath of experience and research related to the mental game and how alter egos can enhance performance is phenomenal. This is not your typical personal development book filled with theories or the author’s personal story (I can do you can too) or just motivational nonsense that isn’t actionable. This book is a “playbook” of the why, what and how of alter egos with lots of real life examples from sports, business, celeb and every day people. Todd reads this himself - and I enjoyed listening to it. Having the audiobook version as well as the Kindle version allowed me to also use whispersync for an “immersive reading” experience. I plan to both listen and read it again- and have already seen the impact of a quick and dirty creation of one alter ego which I then took for a “test drive” using some of the exercises in the book and saw how powerful it could be. Note: this is NOT a “fake it until you make it” technique. It is a way to leverage and access your existing “superpowers” when you need them most - to be your “heroic self” on your most important field of play. While listening to a podcast during which Todd describes the tennis player whose “fairness” values were causing her to pull back and let her opponent come from behind... I instantaneously understood the thing in me that was holding me back. I immediately bought the book and am discovering ways alter egos can continue to help me in the various fields of play that comprise my life. Highly recommended for anyone who knows in their gut that there is more to life...and who’s willing to use their imagination to get it. This is the real deal. I was super excited when I came across Todd's book as I had already been thinking a lot about the concept. I love how he lays out the argument for developing and employing an alter ego, and breaks down the process for its development. He includes things I hadn't previously considered, such as identifying or recognizing your "enemy"... which I interpret as fear, or procrastination, or avoidance, or something akin to what acclaimed author Steven Pressfield, (The War of Art, Gates of Fire, and many others) calls "resistance", and then giving it a name. I especially appreciated how Todd expounded on this particular point using the movie Jaws as an example of how something that is unseen, unknown, and unnamed is way scarier than that which is known, revealed and out in the open. I only recently downloaded the audio book but have already listened to it twice, taking notes all the while. Fascinating material, practical, actionable. Really great work! Loved the alter ego! Very inspirational audio book! Todd Herman not only shows how his method has transformed numerous people across all paths of life but also how to implement it into your life. The audio recording is amazing. Highly recommended! Mike Michalowicz recommended this book via email in which he implied that he had used the technique. The title immediately intrigued me. All throughout the reading of this book I would get distracted thinking about doing what the book was asking. I had multiple alter-ego-type events in my teen years where I was able to imagine my way into a state of being that was more desirable than where I started. I even sort of lived a double life back then as a normal kid at school, but a popular kid at the mega church I belonged to. I already understood the power, but it's not something I had thought about in a good long time. I started to go into my present situation in this space, but it didn't seem like a review of the book so I erased it. It seems like my willingness to talk intimately about my life probably suggests something positive about the book. In the end, I bought a version to read because I want to go through it again at a pace where I can stop to think and do the things the book asks. Listening to it while driving only gave me the opportunity to think about what was being said. Real & no BS tools to help you perform better in life and achieve greatness. There are many books out there that speak about High Performance and how to improve your life. However, this book is based on real experiences, from someone who has been on the playing field for many years and has proven results, working with athletes, entrepreneurs and successful people. If you want to transform any area of your life, don´t waste your time and get this book, it will be worth every cent. Harness the power of your creative imagination! The power of the Alter Ego Effect is brilliantly captured in this book. Todd Herman talks through how to harnesd the power of your creative imagination so you can, within minutes, start to shape a narrative about you that serves you. As an athlete I've unknowningly used Alter Egos for years to perform on the hockey field. But by consciously going through Todd's Alter Ego process I've been able to launch a successful podcast, start a coaching practice and push myself outside my comfort zone. This has helped me achieve goals that I had forever though were just "good ideas". I'd highly encourage you to listen in close and use Todd's principles to pull out the YOU whose capable of greatness.. whatever your Field of Play. ...that could have been a great, longer article on Medium. As a book, for me at least it falls into being too repetitive, over categorising and dramatically labelling simple concepts, processes and methods that would have been much easier to understand and remember if approached differently. But in order to provide some unique formula to this phenomena that many people will recognise and confirm to have been using in some way, one needs to brand and label the content. I don’t dig that. A must for any professional. this book is a game-changer and I am so happy that I heard about it on the entrepreneurship elevated podcast. this book teaches you to, I believe, become hyper focused on who will be your imaginary council as discussed in Napoleon Hill's think and grow Rich. once you have decided on who your imaginary council is you then not only seek their counsel but begin to decide what traits and habits and strengths you will glean from them to be used and deployed in your own situation at your beck and call. this is a book that you need the audio and physical version for so that you can refer back to on a regular basis. I am incredibly excited to begin my alter-ego journey thank you Todd.